You know there are many organizations and institutions in the world are the most famous. There are two types of institutions are non-profit organizations and the other will be profit oriented organizations. These both organizations help for the well being of society directly or indirectly. 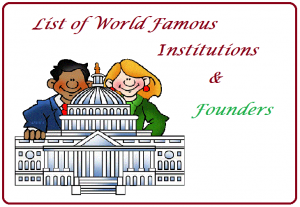 Not only the people interested in knowing about the World Famous Institutions and their Founders, but special for the people preparing for the competitive exams need to know about this famous institutions in the world. This important because in every year we observe some questions related to the organizations and institutions. so be prepare dto answer those questions so that these marks may help you to get the job your work hard for. Every single mark is important for competitive geek to grab the opportunity. Here we are providing the list of famous oranizations in the world and their founder names. We suggest the candidate seriously preparing for the exams to read the list once and save it for reading further. There are high chances of getting a question from this part in any kind of competitive exams in the country. Better don’t let that one question go that may change your life. Press CTRL+D right now to bookmark this website. General awareness infortation about the every thing is available here. All previous Question papers for SSC, RRB, IBPS, IAS (civils), Groups are available in www.allindiaroundup.com. Here we provide all the information about Job notification, Admit cards for exams, Materials and previous question papers for exams, Results declared. Stay tuned for this website for more updates. All the Best…… Don’t hesitate to contact us if you feel you need any information for your preparation. Any queries please comment below, we will get back to you with the appropriate information as early as possible.